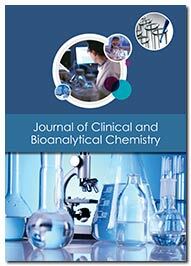 Journal of Clinical and Biochemical Chemistry. Journal of Clinical and Bioanalytical Chemistry is an Open access scholarly journal designed for the rapid publication of innovative research covering all aspects of clinical as well as bioanalytical chemistry. It is basically aimed at clinical methods used to perform tests related to the biochemical analysis of body fluids. The journal scope is broad, encompassing the entire range of clinical and bioanalytical research and encouraging multidisciplinary solutions in this field. Clinical and Bioanalytical chemistry is a sub discipline of analytical chemistry that involves the separation, detection, identification and quantification of biological samples in different settings. It often involves the study of molecules such as proteins, peptides, DNA and drugs. Techniques such as spectrophotometry, immunoassays, and electrophoresis are also used in clinical chemistry to measure the concentration of substances such as glucose, lipids, enzymes, electrolytes, hormones, proteins, and other metabolic products present in human fluids. Clinical and Bioanalytical methods are widely used to quantitate drugs and their metabolites in physiological matrices. The determination of drug concentration in biological fluids is indispensable in pharmaceutical research. In order to investigate the pharmacokinetic of new drug candidates, to compare pharmacokinetic profiles of different formulations, or to monitor drug levels to establish the appropriate dose or frequency of administration, appropriate bio-analytical methods are needed which allow the fast and reliable measurement of the compounds in biological matrices. In today’s drug development environment, highly sensitive and selective methods are required to quantify drugs in matrices such as blood, plasma, serum, or urine. Selective and sensitive analytical methods for the quantitative evaluation of drug and their metabolites are critical for the successful conduct of preclinical, biopharmaceutical, clinical pharmacology studies and forensic studies. Electrochemical detection of anxiolytic and antituberculosis drugs using nanomaterial: A new era in clinical and bio analytical chemistry. Dopamine (DA) toxicity in pathogenesis and therapy of Parkinson's disease (PD).